I spent the week finishing up the Nordic sweaters and the patterns. It always takes much longer than I think to write patterns. I am glad that I did the charts as I went along. I've got a good start on the Confident Beginner Garment. It is turning out nicely. It was a slow week for me. I did receive a package from Italy from Giuseppina for the Swatch to Sweater class. Her design is absolutely lovely. Several students signed up for courses. It seems like knitters like to begin classes in the fall. I know I promised to do more finishing videos but I got distracted by my current project. It is a fitted top which required a very loose cast on edge. A few years back I had a student at a conference (BJ) who showed me a wonderfully simple cast on which is very loose. It is perfect for this project. I've used it in projects in the past. It produces a cast on which is the same on the RS and WS. It looks like little purl bumps. Here is the RS. Here is the WS. It isn't a long tail cast so you don't need to figure out how much yarn you need. I've worked a few rows so you can see what it looks like on the RS and WS. Here is the RS. There will be Salon this weekend. Drop me a note and I will let you know the day and time. It was tough picking a time. The UK basketball team is playing exhibition games this weekend. The sweaters are FINALLY finished (except for cutting the dental elastics out of the sleeves. I hope I remember to do this before the photo shoot!) Note that the designs are different for each size. I especially like the baby size. We decided to do a holiday top for the Confident Beginner series. When I was a new knitter I was terrified of shaping a garment and finishing it so that is what this project is all about. 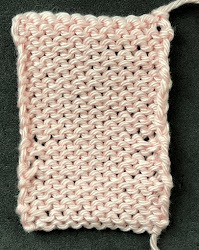 The top is fitted and the back (not shown) is longer due to short rows. Since I do videos for all aspects of these projects, they aren't transportable. I have to work to the section for the next video. I would have had this finished otherwise since I worked this week. The yarn is from S. Charles...two strands held together...mohair and a cotton with sequins. It really is a lovely fabric. It is a simple garment. Since I couldn't carry the top around I started the last project...a mitten garland. The yarn is from RedFish. These are all the colors. The photo is pretty close. I let Elff pick the colors. I didn't want standard holiday colors. I am very pleased with how they are turning out. I think I will make 5 of each color. I love the holiday sweaters. Thanks...they are fun to knit as well.